I really wanted to go to Indiana for All-Write. The lineup of speakers looked fabulous. And I really, really, really wanted to meet all of the people who I have come to know online over the past few years. But I have a kid in college. And another one that will probably be going within the next year. And travel just isn't a possibility right now. But then, it turned out ok. I kind of had my own little personal "All-Write." A couple of weeks ago, my friend Mary Lee, you know, the world famous blogger and poet, emailed me. She was coming to Colorado to see her mom. On Saturday she was going to be in Denver. She wondered if I might be free. To see one of my all time favorite on-line friends?!? The person who has rescued me from numerous online blogging crises??? And sent notes and care packages when the bottom dropped out? And brought red velvet cupcakes to my boys? YOU BETCHA I WAS FREE! And we had a terrific day! Mary Lee and I met at the Botanic Gardens. Photographed the flowers (that was Mary Lee!). Watched the bees (that was me!). Went to lunch by the Tattered Cover. And didn't even go in to buy any books! Almost like my own personal Colorado All-Write! Thanks, friend, for such a delightful day! Pudding Days at the Senior Center are just not his idea of a good time, and ten-year-old Ben Silverstein is not that excited about spending the summer with his grandfather in the rundown town of Buttonville. Shortly after he arrives, he meets Pearl Petal, who claims to have seen a dragon land on the roof of the old button factory. And then Grandpa Abe's cat brings in a baby dragon. The cat has torn the baby dragon's wing, so Ben and Pearl decide to take it the only veterinarian in town, Dr. Woo, who happens to specialize in worms. At the vet, Ben neglects to close a door tightly, and a giant, hairy, horrible-smelling creature escapes from the button factory. Ben and Pearl must capture the sasquatch before it does real damage to Buttonville. 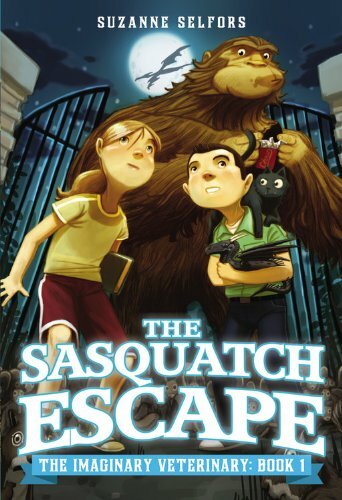 THE SASQUATCH ESCAPE is the first book in the IMAGINARY VETERINARY series. Lots of humor, fairly large print, and Dan Santat's illustrations are going to make this one a hit with fourth grad-ish readers. Book Two, THE LONELY LAKE MONSTER, is scheduled to come out in September.